Israel has a good report card in the health sector in comparison with other OECD nations, as seen in data just released by the Ministry of Health. Israel earned a good report card in the health sector in comparison with other member nations of the Organization for Economic Cooperation and Development (OECD), as seen in data just released by the Ministry of Health. Israel was formally admitted to the group by a unanimous vote this week. Statistics published Tuesday indicate there were fewer hospitalizations in Israel in 2007 than elsewhere in the 30-member group of nations. Israel had a relatively high number of doctors per thousand people compared with OECD members. Israel's dentistry rate was also second-highest in the organization, with 1.08 per thousand, compared with an average of 0.62 in other OECD nations. However, the rate of nurses per thousand people was lower than in other OECD nations – 5.7 compared with 9.6 – and the Ministry of Health is predicting that in future years, Israel's rate of doctors per thousand, compared with the OECD average, may also drop. 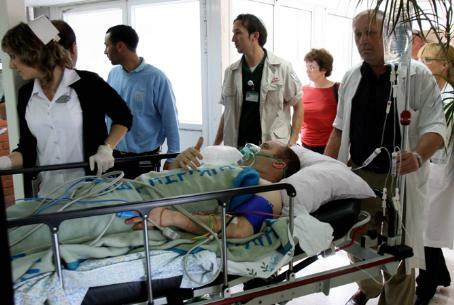 Israel has only 2 hospital beds per 1,000 people, compared to an OECD average of 3.8. Only Mexico has less beds per 1,000 people. The Jewish State's national expenditure on health as a percentage of the GDP – 7.7 percent compared with 9.0 percent -- is low. Israel's percentage of private expenditure on health – 43 percent compared with an average of 27 percent -- was among the highest in the group. Israel's population is also relatively younger than those in the OECD. The percentage of citizens under age 14 is second highest among the OECD membership, at 28.4 percent compared with the average of 17.7 percent. The percentage of elderly Israelis stands at 9.8 percent, compared with the OECD average of 14.7 percent. The life expectancy in Israel was also higher than in the average OECD nation, and the infant mortality rate was lower. Starting in July, the OECD will publish Israeli data along with that of its other member states.